My little sister Monica, a 20-year-old BYU college coed, so selflessly watched our kids on Friday night so we could attend the temple. We left her with three rambunctious youngsters, and returned to three peaceful snoozers. What more could two tired parents ask for? 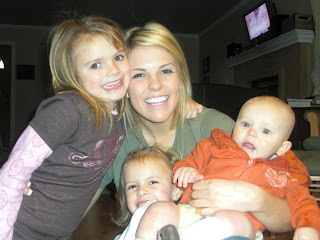 Yesterday, I did discover she hijacked my camera and took some pics with the kids. I think Emmett was having a good time...lol. Having sung her praises, I cannot let this classic college coed moment go unrecorded...What follows is a conversation during a Sunday Scripture game over the holidays. Bruce (7-year-old Nephew): Monica, your question. Fill in the blank. Jesus said the following in this New Testament scripture, "In my Father's house are many_______." Mom: It starts with a "M" and has an "n"
Huh. She wishes! Love you Monica. Sorry I couldn't resist. This had me laughing for hours.